Cryptocurrencies like bitcoin are drawing interest as investments. State regulators issued a statement Thursday advising investors to approach them with caution. A cryptocurrency is a digital medium of exchange that’s created independent of banks or governments. Cryptocurrency prices have been swinging wildly. The price of one bitcoin rose from $1,000 a year ago to roughly $14,000 today. Kevin Anselm wants Alaskans to know a few things about cryptocurrencies before they spend conventional currency – also known as dollars – on them. She’s the director of the state Division of Banking and Securities. “We just want people to know that these aren’t a typical investment,” she said. Anselm said it’s most important for investors to ask questions. She emphasized a basic point. “People need to understand what it is they’re really investing in and what they can expect – and what the offerer is offering – as a return,” she said. Anselm said cryptocurrencies are subject to minimal regulatory oversight. She also said they’re susceptible to cybersecurity breaches or hacks. And there may be no recourse should the cryptocurrency disappear. They’re not federally insured. Anselm said anecdotal reports of Alaskans being asked to buy into new cryptocurrencies prompted the division’s advice. “We’re seeing a number of people contacted by sellers of virtual currencies or sellers that want people to get in on initial coin offerings, including virtual currencies,” she said. 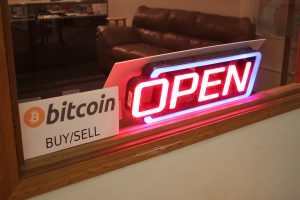 Some Alaska businesses accept bitcoin. One is Alaska Robotics, a Juneau comic book and art store. Co-owner Pat Race said he’s only seen about a dozen bitcoin transactions over four years – and he’s selling some of the bitcoin the store has. Race is glad the state is telling investors to be careful. Alaskans can contact the division if they have questions about cryptocurrencies.